I love stories that make children laugh AND know that kids are really smart. They don't just rely on slapstick humor or potty language (although those laughs are also fun). Some books make kids think to realize the full humor in a story, and the payoff is even bigger. 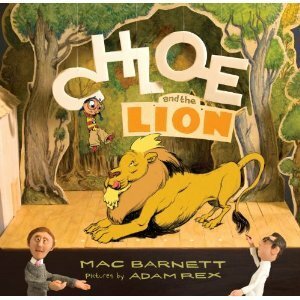 Chloe and the Lion is a book that will bring lots of laughter, but also some interesting "a-ha" moments as kids think about cooperation and creativity, about pictures and words in the books they love. Best of all is the way that Mac Barnett and Adam Rex poke fun at themselves. Readers know from the very beginning that this picture book will be a bit different. "This is me, Mac. I'm the author of this book," waves a sweater-clad clay figure on the first page. Turn the page and you'll see Mac's friend Adam putting the finishing touches on Chloe, the main character of the book. "Well, look. The fact is I don't really care what YOU think. I'm the author of this book. You're the illustrator. That means I'm in charge of what happens, and you draw whatever I tell you." Mac fires Adam, but runs into trouble finding the right person to illustrate his story. Children will laugh at Mac's attempts to draw his own pictures for the book, at little Chloe's attempt to talk some sense into Mac, and the many fractured fairy tale references. But most of all, kids will love the bickering and final resolution of these two friends as they create a truly funny story by working together. As in the best picture books, the words and the pictures work together in perfect harmony, building off of one another at each step. 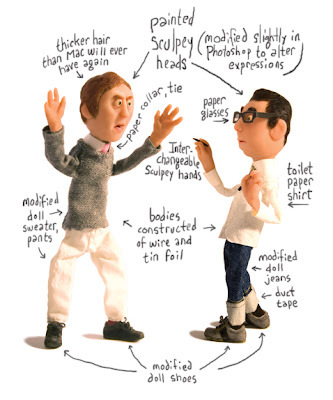 Rex combines clay figures, acrylic paintings, drawn sets, and photographs to create the artwork. Throughout, the artwork heightens the humor just perfectly, helping readers feel the separation between the artists and the story. For other reviews, definitely check out Betsy Bird's review at Fuse #8. Also check out Teacher.Mother.Reader and MediaMacaroni. I especially love how MediaMacaroni talks about this as a perfect book for kids who think they may be too old for picture books. The review copy was kindly sent by the publishers, Disney / Hyperion Books. If you make a purchase using the Amazon links on this site, a small portion goes to Great Kid Books (at no cost to you!). Thank you for your support. My students have loved using iPads at Emerson School. Our library is open every morning recess and we have two iPads for small groups to use. Students read picture book apps, explore nonfiction book apps, and play math games to practice basic math facts. Today I shared some of our experiences with colleagues at our quarterly Bay Area Independent School Librarians meeting. note: price drop right now to $0.99!! 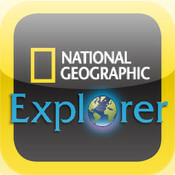 National Geographic has just released this app as a digital version of its classroom magazine National Geographic Explorer for grades 2-6. You buy the app (free) from the app store, and then you download issues from within the app. It is clearly set up for in-app purchases of individual magazine issues. What sets this apart is the way that the developers have layered in many different multimedia ways of exploring information, especially in the Young Explorer issues. The article "Looking at Lemurs" by Mireya Mayor in the Young Explorers issue is an example of the best of nonfiction book apps for young readers. You listen to a scientist introducing us to the topic, you watch videos of scientists in the field studying lemurs, and you can have the text read aloud by a narrator. The issues for older readers are more text heavy - my students would certainly be drawn in by a greater variety of multimedia, whether it is narrated text, more embedded videos, or interactive features. What nonfiction book apps have particularly stood out to you and engaged your children? One participant highly recommended the Barefoot World Atlas, saying that her kindergartners and 1st graders had found it fascinating and easy to use. I'll definitely be checking into this. Word of mouth is still the most reliable source of information. Today I'm excited to share our school's journey exploring book apps for children. I'll be presenting our favorites to the Bay Area Independent School Librarians (BAISL) at their quarterly meeting. You can find the handout here. Today and tomorrow, I'll share here at Great Kid Books some of my students' favorite book apps. I’m fascinated by the question: how much does the medium shape our expectations? or are children really just interested in whether the story pulls them into the experience? When we read a book, we come to expect certain things. We turn the pages, we wait at each page and think a moment. Or we know we can flip the pages back and forth. When we open a web page, we expect to be able to drag the scroll bar up and down, click our mouse on hyperlinks, and use the back button to take us back to where we started. So what are children expecting as they turn on an iPad? How do these expectations - usually developed, quite honestly, with games like Angry Birds - shape their reaction to Book Apps? You expect to poke something and have it respond to your actions. You expect it to change and move. Lovable, furry Grover gets kids giggling every time the read this book app. Callaway Digital Arts and Sesame Street have teamed together to add just the perfect amount of animation and interaction, along with Grover's classic voice, to capture kids' attention from the get-go. Oceanhouse Media lead the way with book apps, adapting many Seuss classics to the iPad. These apps are developed with great thought and care of what will help new readers, often mimicking the way a parent or teacher would read with a child. You read a few lines and look at a portion of the original text. The text never overwhelms the image. If you tap on an image, the narrator names that image and the word pops up in bold letters. Kids come back to these stories because of they respect the heart and feel of Seuss's originals. I love the way the story shines through in this original app. Leonard is a little kid who moves to a new home, a new town where he feels all alone. Leonard's imagination saves the day, as he soars into outer space, explores the jungle, squishes bugs through the house. The interactive features are just enough to surprise kids, but never overwhelm the story. 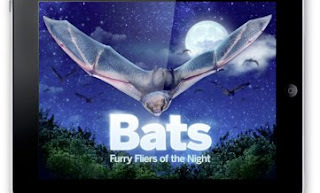 The narration, sound effects and music add to the humor and tone. I agree with Kirkus Reviews: "Well told, cleverly illustrated and beautifully supported with interactive surprises that make sense and are great fun, this is a stellar example of iPad storytelling." Do you have any favorite picture book apps for children ages 5 - 10? We'd love to hear about your favorites. Our biggest frustration is finding out about high quality apps that are worth purchasing. The App Store is filled with book apps, but many do not hold students' attention. Tomorrow, I'll share some of our favorite nonfiction book apps. Search other ebook app reviews at Great Kid Books. Fourth, fifth and sixth graders often tell me they want a funny book. They love the Wimpy Kid books and have read all of them. They've read the Big Nate books. And they want more! 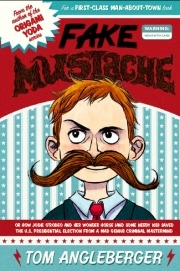 If your kids gobble up funny books and are ready for something even wackier, look for Tom Angleberger's newest book Fake Mustache. Lenny Flem, Jr. is your average 7th grader. Nothing exciting happens in his life. That is until his best friend, Casper Bengue turns out to be an evil mad genius who tries to take over the ENTIRE COUNTRY! It's up to Lenny and Jodie O'Rodeo, a former TV child star, to save the day. It all starts when Lemmy lends Casper the money to buy a fake mustache. This isn't any old cheap fake mustache - it's the Heidelberg Handlebar #7, a mustache that's so powerful that Casper is able to convince anyone of anything when he puts it on! 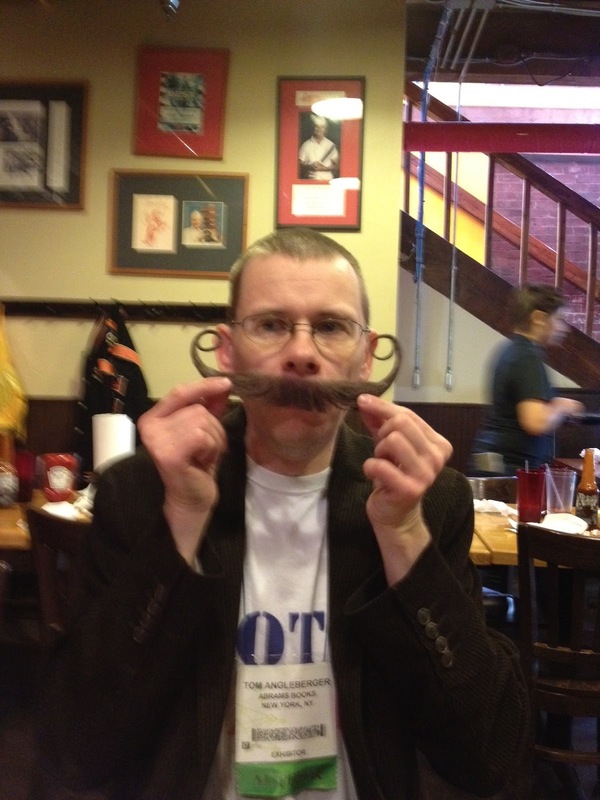 For some extra fun, take a look at Tom Angleberger with his own fake mustache! He's definitely a guy who loves a good joke. Kids are definitely going to recognize his name as the author behind the popular Origami Yoda series. Tom Angleberger sports a fake mustache! Kids are going to love this over-the-top madcap adventure. Angleberger revels in goofy silliness without getting bogged down in too much detail. The plot is fast-moving with enough suspense to pull kids through from start to finish. They're going to love the twists and turns, the wacky characters and the dangerous situations that Lenny and Jodie O'Rodeo find themselves in. You'll definitely need to suspend any sense of reality to enter Tom Angleberger's wacky world of Hairsprinkle, USA. Silliness overflows, and questions of "would this really happen" never enter the conversation. But our early readers have definitely given this a thumbs up, recommending it to their friends as funny and a bit unusual. My one wish is that the book designers made Angleberger's chapter titles more prominent. They're great chapter titles and help keep the plot developments clear for the reader. Young readers definitely need these sign posts to guide their comprehension and understanding of a story. That's especially true for one that takes as many strange turns as Fake Mustache! Finally, for a bit of extra over-the-top fun, take a look at me sporting Tom's amazing fake mustache! I think this will definitely give me some power over kids in my library. 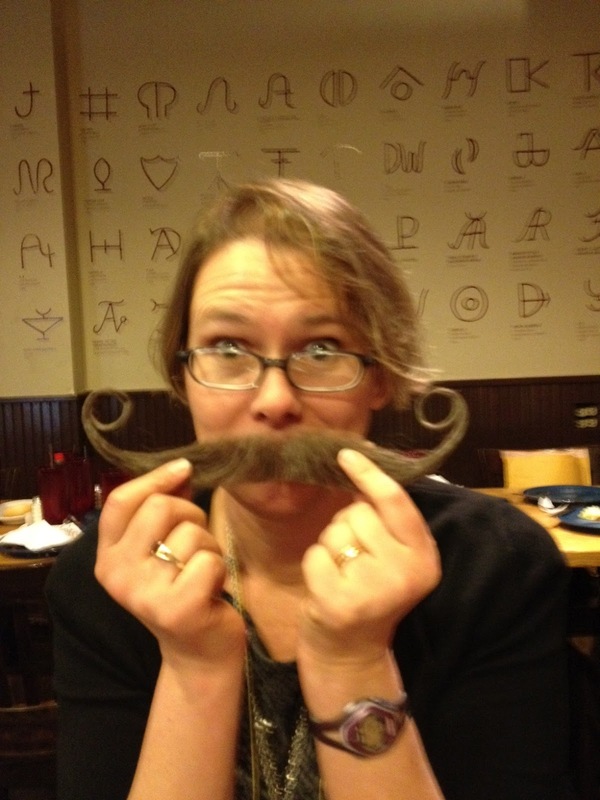 Ms. Scheuer as Fako Mustacho! For other reviews, definitely check out Betsy Bird's at Fuse #8 and Monica Edinger's at Educating Alice. The review copy was kindly sent by the publishers, Amulet Books, an imprint of ABRAMS. If you make a purchase using the Amazon links on this site, a small portion goes to Great Kid Books (at no cost to you!). Thank you for your support. Spring has certainly arrived and kids are so excited to play outside, run through water, pick flowers, examine bugs hiding underneath. All fitting activities for the annual Earth Day celebrations occurring today. A beautiful book to share with young children is My Mama Earth, by Susan B. Katz. I especially love the way the soothing text interweaves with the lovely illustrations. A young child - it could be a girl or a boy - watches the rising sun, thinking of all the glory that its mother and mother Earth brings to our lives. 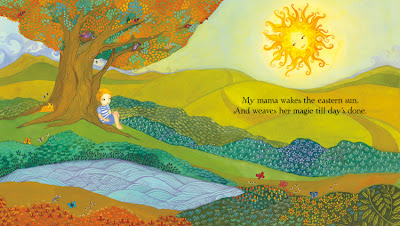 The rhyming text is lyrical and soothing, as the young child thinks of all the places in the Earth that bring him a feeling of wonder and love. And weaves her magic till day's done. Adorning them with brilliant features." Melissa Launay's illustrations richly develop the themes and mood of the text. The settings bring to mind all that we love about spending time in nature. While they are not specific places, they draw children into imagining what it would be like to sit under a tree, watch lions roar, or swim with dolphins. Launay's paintings interweave lush settings with a vision of mama Earth, with long flowing hair. 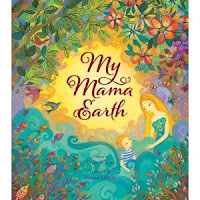 Launay's Mama Earth will appeal to many young children, drawing on a sense of fairy tales and imagination. Susan B. Katz is a National Board Certified, seasoned, bilingual educator with over 20 years teaching experience. She currently works as a literacy coach in Berkeley Unified School District. 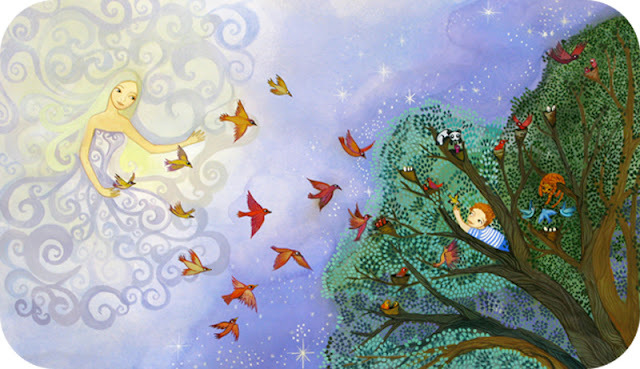 Her sense of what appeals to children is definitely evident in this lovely story. 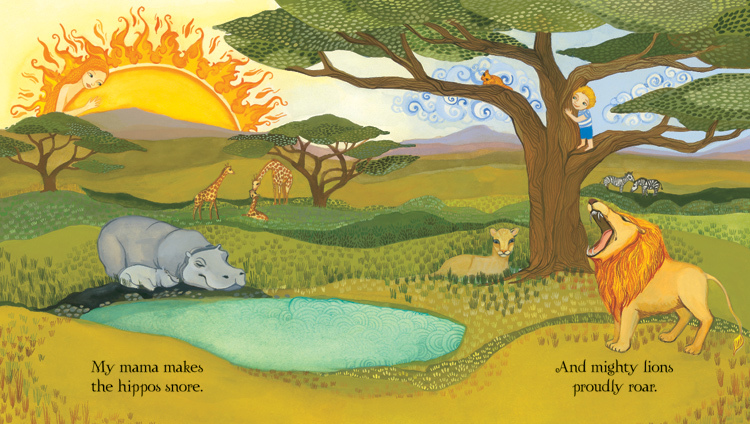 This is Launay's first picture book - hopefully she continues to apply her art more in this field. Read more about Launay's process developing the illustrations for My Mama Earth over at her blog. The review copy was kindly sent by the author, Susan Katz, and her publishers, Barefoot Books. If you make a purchase using the Amazon links on this site, a small portion goes to Great Kid Books (at no cost to you!). Thank you for your support. All month we're reading funny books at Emerson. The kids are loving it! Nothing motivates kids more than a joke, especially when they are "in the know". Today, we had such fun reading classic Amelia Bedelia and laughing at the word play. I can't wait to share a new favorite: E-mergency! by Tom Lichtenheld and Ezra Fields-Meyer. The word play and puns are hilarious, and will have kids coming back to this again and again. Eeeeks! The letter E is falling down the stairs! All the letters of the alphabet live in one big house, and so they all came running to see if E was hurt. Letters R and U asked, "E! Are you OK?" and the letters O and K said, "No, we are." The letter X helpfully marked the spot where E tripped. Kids will love seeing the havoc caused by this plan. There is a "Spocial Bullotin" on television, with Exclamation Mark giving the announcement: "Do! Not! Uso! E! until! Sho! Rocovors!" They'll laugh at the store signs: "Ico croam" "Jan's Shoo Shop" and "Targot". Clearly, this book is meant for proficient readers who can figure out all the word puns. 2nd and 3rd graders have loved reading it again and again, looking for all the puns and jokes hidden within the busy pages. This is not your typical alphabet book for little kids, but rather one layered with all sorts of jokes that older kids will enjoy. The story behind E-mergency! is fascinating. Amy Krouse Rosenthal sent Lichtenheld Alphabet House, a video by a Los Angeles high school student, Ezra Fields-Meyer. Fields-Meyer is an accomplished animator, and his video started Lichtenheld thinking about this story. Read more about the development of this story over at ReaderKidZ. You can see more of the interior artwork over at Tom Lichtenheld's website. My students love, love, love his books. If you want more picture books that will make you laugh, check out two other favorites he illustrated: Shark vs. Train and Duck! Rabbit! I can't wait to see his most recent Zero the Hero and his upcoming Wumbers. For other reviews, check out A Year of Reading, Bookends, ProseAndKahn, and Waking Brain Cells. Teachers, you'll want to head over to Chronicle Books' site to see their great Teacher's Guide, along with an extensive activity kit and Reader's Theater script. The review copy was kindly sent by the publishers, Chronicle Books. If you make a purchase using the Amazon links on this site, a small portion goes to Great Kid Books (at no cost to you!). Thank you for your support. Do you love a laugh? Do you love watching your kids laugh, giggle and chortle at many levels of humor? Mo Willems' newest Pigeon book is sure to please. The Duckling Gets a Cookie?! continues the friendship between Pigeon and little Duckling, but this time the tables are turned. Pigeon is outraged that Duckling got a cookie and he didn't. A COOKIE?! JUST BY ASKING FOR IT?! Pigeon is back, with all his tantrums that make kids laugh out loud. In the opening spread, the little duckling asks for a cookie and receives one immediately. "Thanks! That was very nice of you!" says Duckling, oh so sweetly. In walks Pigeon, and he's shocked, shocked that Duckling gets a cookie - just by asking! Pigeon tells us, "I ask for things ALL THE TIME!…But do I get what I ask for?" Kids will laugh at Pigeon as he starts to have tantrums, demanding a cookie, pleading for a cookie. But really, kids are laughing at how they themselves throw tantrums over silly things, while Duckling quietly gets what he wants by asking for it (quite politely). It's so much easier to recognize Pigeon's out-of-control tantrums than to see them in yourself. Willems' Pigeon books can help families talk about tantrums in a safe way that isn't saddled with emotion and blaming. Kids can laugh at Pigeon and talk about why Duckling got his cookie. And, yes, you can ask them to think about kids they know who throw a tantrum. Does it get them what they want? The Duckling Gets a Cookie!? is perfect for new readers. Willems conveys so much emotion through the simple dialog and expressive illustrations. And the humor will bring kids back to reading this again and again. Best of all, it will get new readers to read aloud with expression and emotion - making their reading fun. What more can you ask for? A cookie? Well, yes I would like one if you could. Head over to Watch.Connect.Read to see a great trailer and find other fantastic resources for The Duckling Gets a Cookie!? The review copy came from our school library. Please support your local school library and donate books once you are done enjoying them. If you make a purchase using the Amazon links on this site, a small portion goes to Great Kid Books (at no cost to you!). Thank you for your support. Image from Entertainment Weekly, March 2012. With a bit of luck, April will bring the perfect combination of rain and sunshine, and our hills will shine in brilliant green. Children have an innate sense of the seasons and they marvel in the magic of watching a plant grow. In many ways, it’s a microcosm of all the changes their little bodies are going through. Here are a few books that celebrate watching our gardens grow with our children. Enter the world of a meadow garden and look carefully around you. You’ll find seeds that have been planted in so many different ways: scattered by the wind and rain; eaten by a flock of birds; carried away by foxes’ tails or peoples’ clothing. Galbraith and Halperin work together seamlessly, showing through poetic words and soft illustrations just how wild plants spread their seeds and how seedlings then grow into wild plants. Young children will be fascinated by the drawings that show small sequences of seeds germinating, and plants growing and taking root. Halperin balances these small panels with larger sweeping landscapes. The lyrical text uses sound effects as the rain and wind whisk seeds away. This is a perfect book to intrigue little gardeners and nature lovers. Please also see reviews at The Nonfiction Detectives and the Jean Little Library. Children love gardening, whether it’s digging outside in a large garden or planting a seed in a small pot. This book celebrates the joy a young child in the city has in creating a window box full of beautiful flowers for her mother’s birthday. Starting with a trip to the nursery, readers follow a young African- American girl and her father home to her apartment. “Garden in a cardboard box/ Walking to the bus/ Garden sitting on our laps/ People smile at us!’’ The brief rhyming text is lovely to read aloud, enthusiastic and full of happiness. The rich, warm paintings invite readers right into this family’s home, sharing the excitement of preparing this gift for her mother. Best of all, this book celebrates gardening together as a family, creating beauty for everyone to see. Head over to this month's Parents Press where my monthly Bookshelf column looks at books celebrate springtime in the garden. These books all came from our wonderful school library. Please support your local school library and donate books once you are done enjoying them. If you make a purchase using the Amazon links on this site, a small portion goes to Great Kid Books (at no cost to you!). Thank you for your support. If you're looking for a book that will tickle your 3rd or 4th grader's funny bone, pick up a copy of Forgive Me, I Meant to Do It. 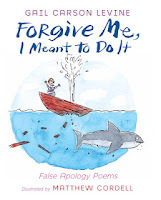 At first glance, these poems might seem a bit off kilter, but they are perfect for kids who like a twist, something brief but perhaps unexpected. Do you know the poem by William Carlos Williams' poem "This is Just to Say", in which he describes the delicious plums which he has just eaten from the refrigerator. He leaves a note apologizing for eating the plums, which you were probably saving for breakfast. But is he really apologizing? more than five magic beans." This collection is perfect for 3rd and 4th graders who know these stories and can appreciate the twisted perspectives - the unappreciated cow taking revenge on Jack. These nine and ten year olds are also in a perfect place to try writing their own poems. Here's another poem favorite my students love from this collection. 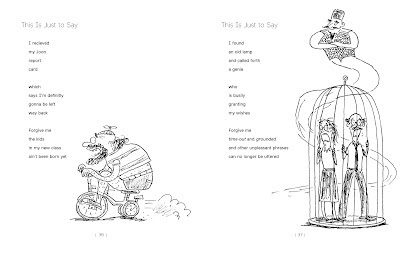 Take a look at the poem on the right, below, and see if you can figure out why the parents are trapped in the cage. Head over to artist Matthew Cordell's blog to see this more clearly and read a selection of poems from the book. For other reviews, check out Franki's at A Year of Reading, Betsy's at Fuse #8. The review copy was shared by my favorite local bookstore, Mrs. Dalloway's in Berkeley. We will be buying a copy from Mrs. Dalloway's and donating it to our local school. Support your local schools and bookstores - make a donation to your local school library during April to celebrate School Library Month. If you make a purchase using the Amazon links on this site, a small portion goes to Great Kid Books (at no cost to you!). Thank you for your support. My students love books that make them laugh. All the time, kids ask me for funny books. So we've been inspired by April Fools, and are celebrating funny books for the whole month. My plan is to culminate it with a celebration of jokes we love to tell, timing this with our lead-up to state-wide testing week. What a nice thing to balance the pressure of testing - seeing jokes posted all over the school! My ulterior motives are two-fold: provide motivation for reading (remember, the more kids read, the better they get at it) and provide opportunities to talk about puns, double-word meanings, and ways we play with language. Do your children have favorite funny books? This month, I'm going to be sharing some of our favorite funny books for elementary students. Bad Kitty - this series draws in kids from 2nd grade through 5th grade. 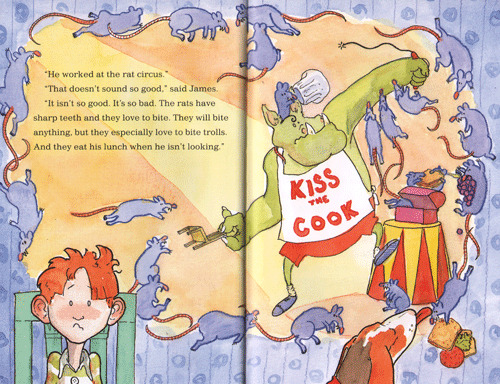 Kids love how cranky Bad Kitty gets, and they just love Bruel's hilarious illustrations and wacky writing. My favorite in the series is definitely Bad Kitty Gets a Bath. So far, early reviews show my students are definitely voting for the newest book: Bad Kitty for President. Geronimo Stilton - this is another series that draws kids in with its pictures and bold, colorful fonts. Geronimo and his cousin Thea Stilton write great adventure stories for kids who have moved beyond Magic Tree House but still want pretty quick reads. My Weird School - this wacky series features over-the-top antics with a group of 2nd and 3rd graders. The series starts when AJ and his friends are in 2nd grade, with Miss Daisy is Crazy. The My Weird School Daze series starts with Mrs. Dole is Out of Control, as AJ and his friends graduate from 2nd grade and head into summer adventures. Each of the book titles rhymes and introduces another crazy adult. The pictures and fast-paced stories make these fun, quick reads. Diary of a Wimpy Kid - this is the most popular series with our 3rd through 5th graders, no question. Kids love Greg's humor, cartoons and constant troubles. They can laugh at Greg, while relating to his woes and knowing just how he feels. I know that some teachers and librarians don't like kids reading this. But my feeling is that if kids are finding it funny and are hooked on reading it, it can serve a wonderful purpose. I would just really check in with them and see what parts they find funny, are they really understanding the story and the humor. Big Nate - this series is perfect for kids who love the cartoons and school-humor of the Wimpy Kid books. Our students love the humor, the cartoons and the pacing of this story. Like the Wimpy Kid, Nate's trials and tribulations seem oh-so-familiar to many of our students. My students are going to be very happy to find the newest book when they come back from spring break: Big Nate Goes for Broke. Dragonbreath - our 4th graders have also loved this series, featuring Danny Dragonbreath and his best friend, an iguana named Wendell. Again, students are drawn to the illustrations and quick pacing. This series balances fantasy (after all, it features talking little dragon) with characters kids can relate to. Best of all, if kids like the first Dragonbreath book, they've been really happy to read more in the series. What are your favorite silly books? My hope is to share even more this month, both old and new favorites. Spring is truly coming and we have been having fun with a delightful new book by Anita Lobel: 10 Hungry Rabbits. This counting and color book offers a chance for young children to practice counting and color names with a sweet, comforting story. Each page show a large, soft illustration of the vegetables, and then smaller detailed scenes of the rabbits in the garden. Children will notice many layers of details - from the rabbit's clothes matching the color of the item they find, to the textures of the foods. The pink potatoes are full of dimples and eyes, and the orange carrots look like they've just been pulled out of the ground. "This concept book has an original story line, engaging characters, rich language, and a predictable visual and narrative pattern, and the concepts themselves are reinforced in multiple ways in words and pictures, some subtle and some obvious. Best of all, it's the sort of picture book you can read aloud just for the fun it, even if you don't care about teaching numbers or colors." The review copy was kindly sent by the publishers, Alfred A. Knopf and Random House. If you make a purchase using the Amazon links on this site, a small portion goes to Great Kid Books (at no cost to you!). Thank you for your support. Tales for Very Picky Eaters, by Josh Schneider (ages 4 - 8) - a hilarious book for new readers! Children who are new to reading on their own love funny books - something that surprises them, that isn't quite what they expected. And yet they need fairly straightforward books that are easy to grasp, perhaps because children can relate to the situations or the author develops a pattern so the reader knows what to expect. If your child is now reading books with a series of short chapters, much like the Henry and Mudge books, definitely look for Tales for Very Picky Eaters - it will have the whole family laughing out loud. Do you have a picky eater in your house? Night after night, James tells his father that he just can't eat this or that. "I can't eat broccoli," said James. "It's disgusting." You know how it goes. The lasagna is smelly; the oatmeal is lumpy; the milk is repulsive. "But if you don't like it, I suppose we will just have to tell him to leave. He'll be so upset. He'll have to go back to his old job." "What was his old job?" asked James. "He worked at the rat circus." "That doesn't sound so good," said James. "It isn't so good. It's so bad. The rats have sharp teeth and they love to bite. They will bite anything, but the especially love to bite trolls. And they eat his lunch when he isn't looking." Children love seeing how the father spins these outrageous tales, until at the very end James turns the tables on his father when he actually decides to try something new. Schneider's humorous cartoon illustrations will draw in reluctant readers, and help new readers understand the progression of the story. This book is perfect for 2nd graders learning to read and write dialog in stories. The silly illustrations and preposterous situations will keep them turning the pages. It's definitely a winner all around! Many congratulations to Josh Schneider for winning the 2011 Theodore Seuss Geisel Award for Tales for Very Picky Eaters - it's definitely well deserved. Do you want to find out more? You can see a preview over at Google Books. Over at TeachingBooks.net you can listen to Josh Schneider talk about this book and read an excerpt.